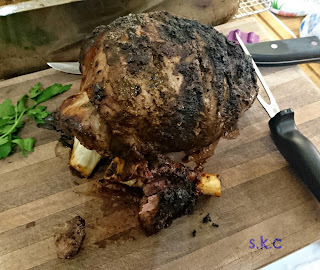 I arrived home from a lovely break with my friend to husband announcing he had bought a leg of lamb to roast. 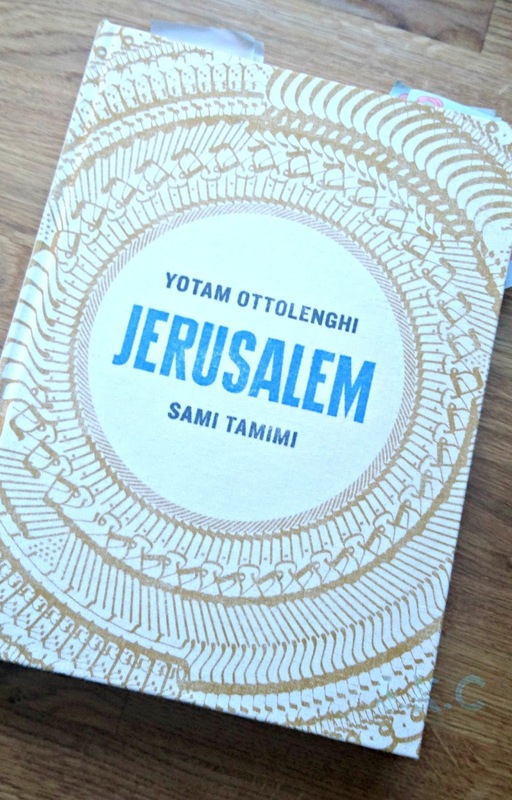 I felt inspired once again by Annabel Crabb, this time by her love for all things Ottolenghi. I found out about this glorious cookbook through the Crabb/Sales Podcast Chat 10 Looks 3. It's a great podcast. It feels like you're sitting with (highly intelligent, well-read, knowledgeable) friends having a laugh. I do appreciate that they educate me about all things current: TV shows, books, and cooking amongst other things. 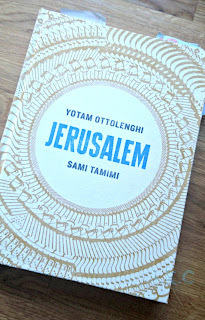 I also feel kind of smug that I can now let Yotam Ottolenghi's name roll off my tongue like an old pro! I flicked through the book and came across this lovely recipe for Lamb Shawarma, which is traditionally a spit roast type arrangement, more like our good old kebab shops. 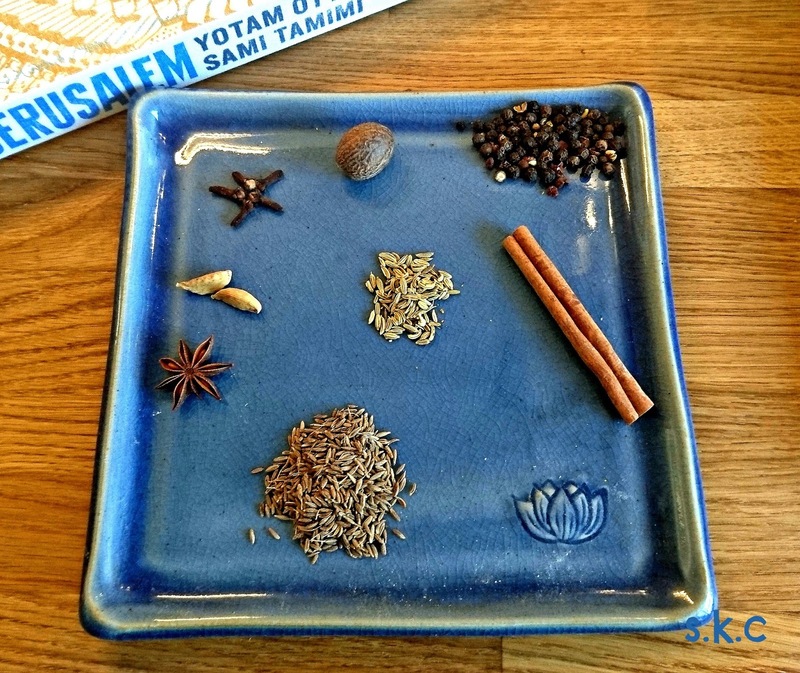 Understanding that most people don't have access to one of those, a recipe is given for marinading (or is it marinating? Can someone tell me the difference?) and slow-roasting the lamb instead. 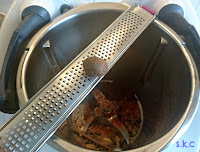 Thermomixing is our only option at present, as we have no cooktop - we are still amidst our kitchen renovation. 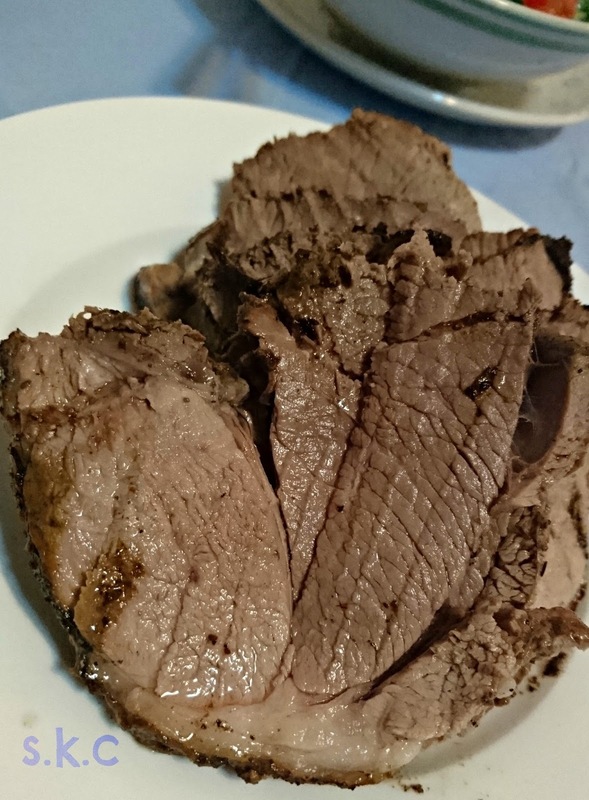 So I've thermomix-ified the recipe, as follows. 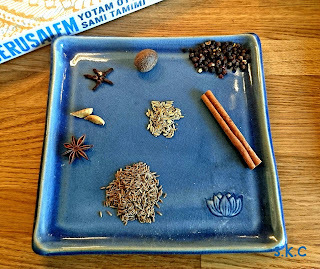 First to dry roast the spices. I googled a similar recipe, and took the ideas from Thermofun here, but not for as long, following the suggestion of only a minute or two from Ottolenghi. I cooked for 2.30 min / Varoma / Speed 2. 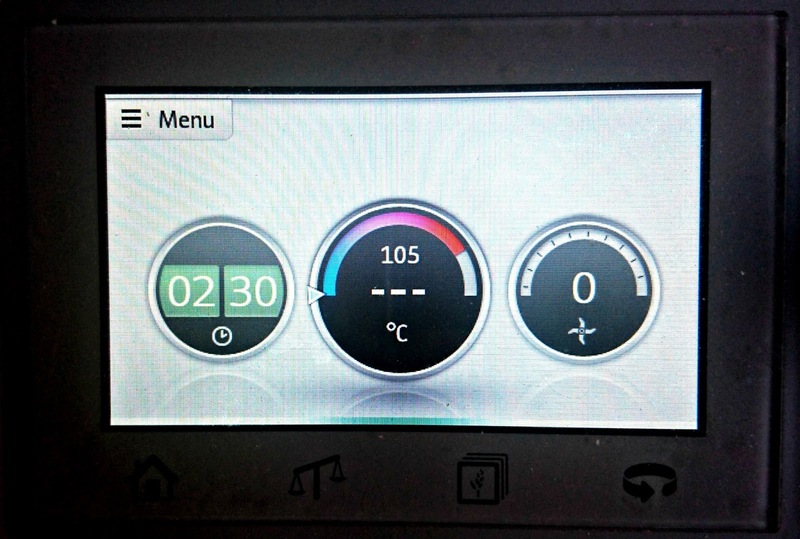 However, it proved that the Thermofun recipe was more accurate - I was looking (smelling?) for the fragrance of the herbs, and kept repeating my initial 2.30 until I got an intense enough fragrance - which ended up being about 15 minutes. 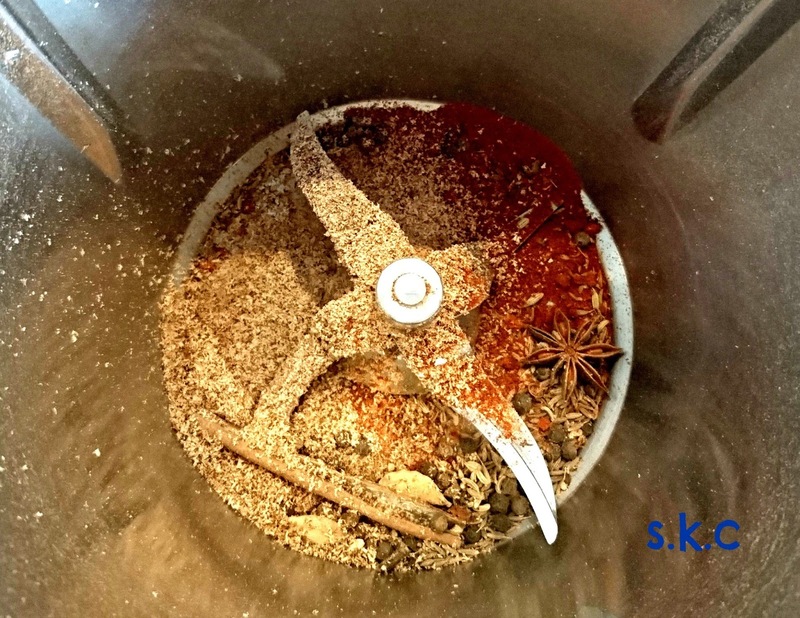 I love the way the Thermomix controls the heat so that the spices don't burn (and I can be distracted on facebook and blogger and all), but I guess it means the heat is not quite so intense, and process is longer. Then I added the other spices and repeated the 2.30 min / varoma / speed 2 - to roughly equate to the 'few seconds' from Ottolenghi's frypan method. 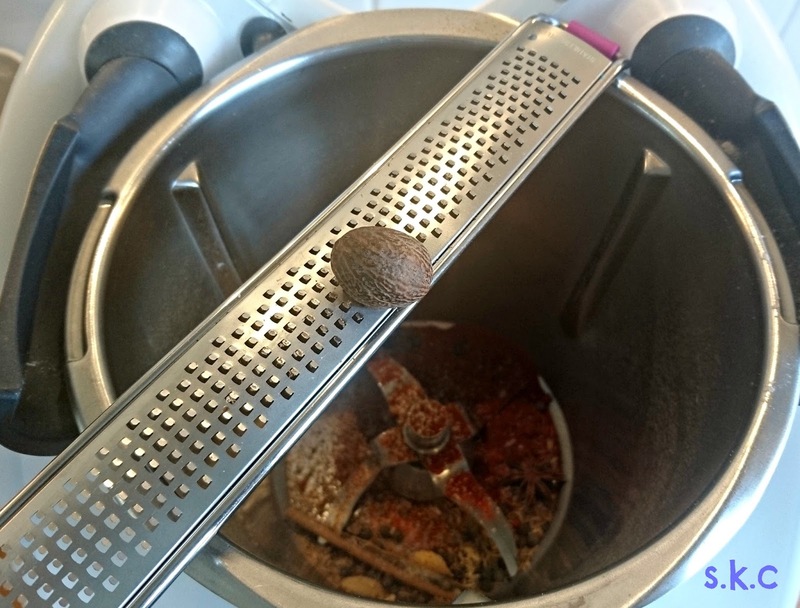 Then, again checking the Thermofun curry recipe, I blended the spices: 30 seconds at speed 9. 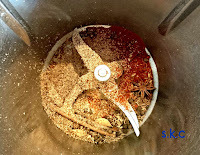 I scraped the bowl down, checking for 'uniform consistency' and gave the spices another 15 seconds at 9, just to mill the slight chunks still left. Blitzed the garlic & ginger in Thermie. Lazy, but quick. There is nothing at all attractive about that marinade. I elected *not* to show you the picture. It was more than unappealing. But oh, the fragrance is divine. 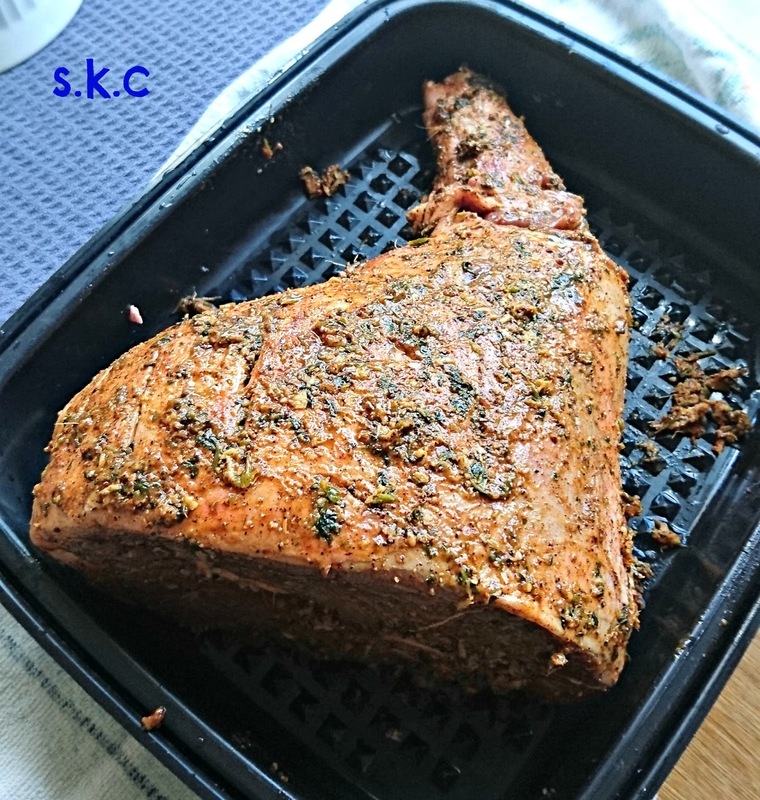 There is also nothing attractive about raw meat, so I will spare you, although I have included a picture of it slathered with the marinade, absorbing those glorious flavours. We left it for approximately 1 hour to marinade, before starting the slow cooking. Ideally it should have been left for several hours / overnight! The moment the lamb hit the heat, the house was filled with glorious aromas. 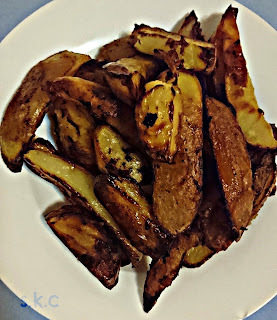 We added boiling water to the bottom of the roasting pan and reduced the heat to 180 C.
Meanwhile we steamed potatoes, to par-cook them. They were then tossed into the liquid in the baking pan. Once the meat was ready and resting the potatoes were returned to the oven in another pan at 220 to crisp up. 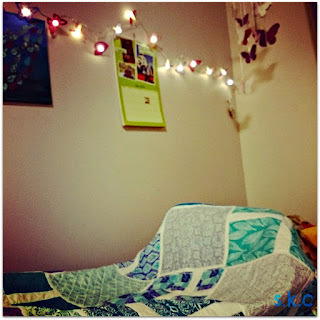 Husband declared it Perfectly Done. Husband doesn't often bestow such praise. Perfection - juicy, tender, fragrant, smoky charred flavour. The lemon juice added a freshness to the flavour which had infused right through the meat. It seemed sacrilege to wrap such amazing meat in a pita and dilute the flavours at all, as the recipe suggested. It's really not possible to photograph meat well, but I've done it anyway because I wish you could share it! We enjoyed the meat in its own right. Along with potatoes - definitely fabulous: the outside was crispy and the inside simply melted! 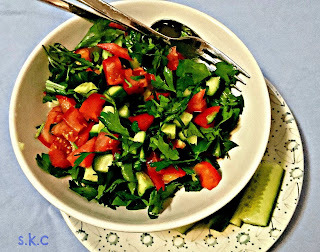 and a simple salad of cucumber, tomato, parsley and lemon juice. Surprisingly, this was the perfect accompaniment to our roast. Princess declared it the best. salad. ever. I declare the meat the best I've ever eaten. I don't think you could say we exaggerate do you?